Well, I’ve got a really fun episode to share with you. Last Saturday, I was at PLAY by Tuft‘s hairstyling event and I totally embarrassed myself with the tools in front of the professional stylists. I can’t style my own hair for nuts (or rather, I’ve not attained that skill) – I can’t do all those pretty braids, because instead of my hair tangling, my fingers tangle with themselves. With regards to hair, I’ve pretty much called it quits. BUT that didn’t stop me from wanting to attend this event, because I really wanted to learn. Haha. The event was held at Classic by Tai Wah, a hair-pampering gem located at Cecil Street. The salon gives off an elegant and a muted luxurious feel, and it sure is spacious! We were greeted by this gorgeous table spread. PLAY by Tuft has this impressive range of professional home-hairstyling tools that is wallet-friendly, sophisticated, and chic. If you’re wondering why the theme of the table display was ‘TRAVEL’, you will be delighted to know that PLAY by Tuft features travel size hairstyling tools! A closer look at their Mini Travel Styler that doubles up as a mini curler. It doesn’t take up a lot of space in luggage and the best thing is, it comes in dual voltages, which means you don’t have to worry about voltage differences wherever you go. For those who bring bulky hairstyling tools along when you travel, now here’s a LEGIT tool you can consider getting. Using the PLAY Mini Travel Styler. It is possible to achieve two types of styles with this tool. One side of the mannequin’s head was straightened and curled at the ends, while the other side was curled to create a voluminous wavy hairstyle. As such, this tool is suitable for both long and short hair. Using a PLAY Heated Brush to smooth messy and frizzy hair. Using the PLAY Smart Styling Iron to achieve glorious waves! You can choose between 1″ or 2″ plates for different size curls, and the plates are coated with Titanium for a smoother glide, preventing painful tangles and burns. Thank you PLAY by Tuft for such a heartwarming event. Everything was well thought out, there was food, fun, and laughter. The tools were so cute and handy. The Stylists were really friendly and helpful, I feel more confident in using a curling iron now!! Lol. Tai Wah Distributors started in 1956 as a partnership and reincorporated as a private limited company in 1971. It started as a regional Distributor in Professional Hair and Beauty Care Products and had been responsible for introducing renown brands in this trade to the regional markets. With our professional heritage and expertise, we decided to venture into the development of machine and equipment for the hair and beauty trade in 2001. Tai Wah Distributors started our house brand, TUFT. TUFT has received steady acceptance and growth in the South East Asia Market over the past decade, focusing on innovations in speciality equipment and appliances for the hair & beauty professional. [Beauty] 50’s inspired hairstyle with Panasonic Multi-styling Straightener! 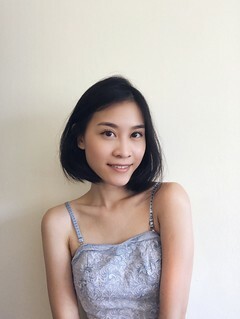 [Event] Beauty DIY – Judy Lin “女人我最大”林叶亭老师 in Singapore!